Spiders is a sturdy house which, upon close inspection, reveals exquisite detail and craftsmanship. 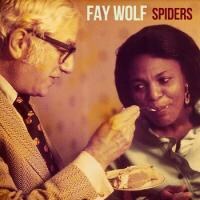 Fay Wolf's musical innovation comes mainly in the form of an impressive range, using the canvas of standard singer-songwriter compositions on her debut full-length Spiders to touch on everything from sultry chamber pop ("The Thread of the Thing") to heartfelt ballads ("Backstage Girl") to the boundaries of tinkly indie-pop ("See Monkey") and ethereal dream pop ("Easy"). Wolf reminds me of Tori Amos in her prime or, more precisely, Tori Amos if she had come along a decade later and been influenced by Rufus Wainwright and the early work of Ingrid Michaelson, with whom Wolf shares a certain vocal similarity. Even the relatively weaker moments, "Black people" in particular, show Wolf's ability to create a lush soundscape, though the shifting tone of that track feels schizophrenic and confusing. What's surprising is that, with all of the subtle but disparate styles thrown into Spiders, that the whole album doesn't feel more disconnected; it's a testament to Wolf's tenacity and fresh-eyed approach. The careful, loving construction of the songs, the relationship between the languorous guitars, moody piano, and half-whispered lyrics, all speak of a songwriter with endless artistic and commercial potential.